The latest addition to the Coastal Transportation fleet, MV Coastal Standard, was built at Dakota Creek Industries Shipyard in Anacortes, Wash. with a design developed to maximize cargo carrying capacity while minimizing construction and operating costs, according to the shipbuilder. With help from its SCHOTTEL propulsion system, the vessel also scores high marks in safety, maneuverability and operability. 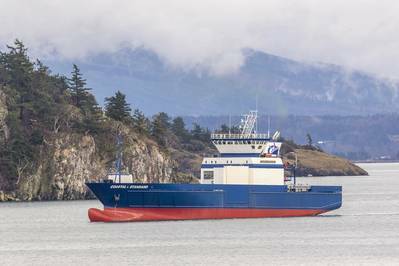 The vessel’s owner, Seattle-based Coastal Transportation, owns and operates a fleet of cargo vessels sailing from Seattle to ports throughout Western Alaska and the Aleutian Islands, delivering cargo such as construction equipment, fishing supplies, household goods and refrigerated perishables. In Dutch Harbor (Alaska), Coastal Transportation maintains efficient dock and cold storage facilities. Here, cargo moves quickly across the dock into one of Coastal Transportation’s vessels, to be transported to Seattle. From Coastal’s Seattle terminal cargo can be distributed to other destinations in Seattle, North America, or around the world via truck or rail connections. For these services, fast and reliable vessels are needed with excellent maneuvering properties for various Alaskan and Aleutian ports. SCHOTTEL said its propulsion system is an important part of the concept; the SCHOTTEL Controllable Pitch Propeller type SCP 77/4-XG (2.300 kW) provides a high free running speed and excellent maneuverability and operability, with no need for a reversing gear – contrary to conventional shaft line solutions. The pitch of the propeller blades can be adjusted for maneuvering and to adapt to changing operating conditions. The SCP is supported by two SCHOTTEL Pump Jets SPJ 85 RD (360 kW each). The two SPJs are fully capable azimuth thrusters, enclosed completely in the vessel’s hull. They are maneuvering aids and, at the same time, redundant take-home devices. For the customers and employees of Coastal Transportation this means the utmost in safety and reliability. The 2,200-DWT freighter vessel is 242 feet long, with nine single cabins for crew and one cabin with four crew berths for extra crew or guests.